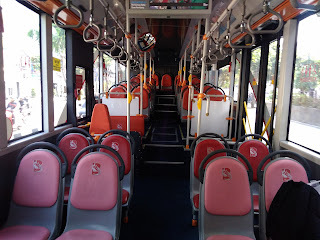 So, it's quite an old post but worthy to share my Suroboyo Bus experience in English, because of it seems personal blog rarely use English for this topic, you can read my following story here, and enjoy the read. "I hardly see any public transportation around here," one of my foreign friends told me three years ago. She felt uneasy because she's got a new buddy (that's me!) and speaking Bahasa for order transportation was difficult for her. 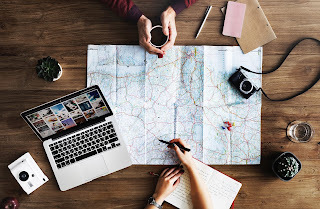 2015 is the very first year of Go-Jek served Surabaya that time, and its operational's conflict interest still in debate whether online transportation can be used in public area. 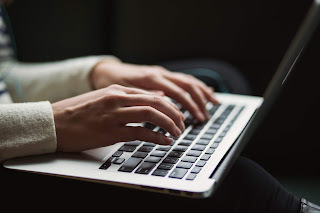 My friend used to be paid more expensive because lack of knowledge in Bahasa while negotiating the price with online transportation driver (sometimes, you will be found a driver that made expensive rate than in application). So, it's been happy news when Surabaya's city government announced their public bus called Suroboyo Bus with designated routes and seats for transportation security matters. 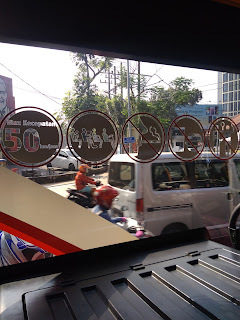 Even though not every area in the city can be covered by this transportation, it's still a very safe transportation option for now because they have CCTV in the bus and the bus' announcement system can speak between Bahasa Indonesia, Javanese, and English, a very helpful guide for the foreigner. We can also view where's the closest bus and it stops through Go Bis Surabaya mobile application (supported in Android). Suroboyo Bus has several regulations for its passengers. First, for tickets, passengers need to bring their own bottle trash (5 bottles for 600 milliliters or 3 bottles for 1,5 liters) and give the bottles to the staff in main terminal (Bungurasih and Rajawali) for trash coupon or every bus stops for Suroboyo bus (you can see 'BUS STOP' with the red color background in asphalt) then the bus staff there will take your trash and give you your bus tickets. Second, waiting for your bus and tell the bus conductor where are you go once you take off, he/she will print out your ticket and stamp your coupon to be marked. Before that, make sure you check your bus route if you need to make a transit to change the bus route in your way. 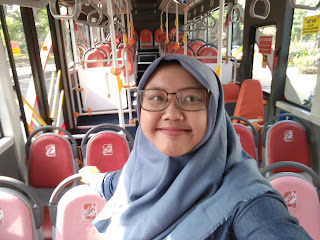 For example, I took my bus from Dr. Soetomo hospital stop, then just realized that the bus will go to ITS stop before went back to Pakuwon Mall. The bus conductor told me to stand by in Hockey field stop, across Dr. Soetomo hospital. For a while, I was waiting and talking to spent my time there. One auntie told me that Surobooyo Bus won't take a passenger if their route is in another round of their routine. Third, choose your own seat, there designated seats for the public (orange), women (pink), elderly, and disabilities (red) to avoid sexual harassment and also for accessibility for elderly and disabilities you can choose or you can stay stand up if it's too crowded. If you do a short route, it's okay to sit close to the door. 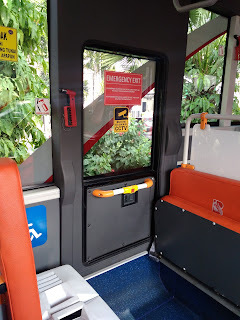 However, if it's a long one, you're better to sit far from the door because the seat sometime uses by elderly, pregnant women, women with their child, and disabilities companion. The bus stairs' quite high for children and elders to step on. 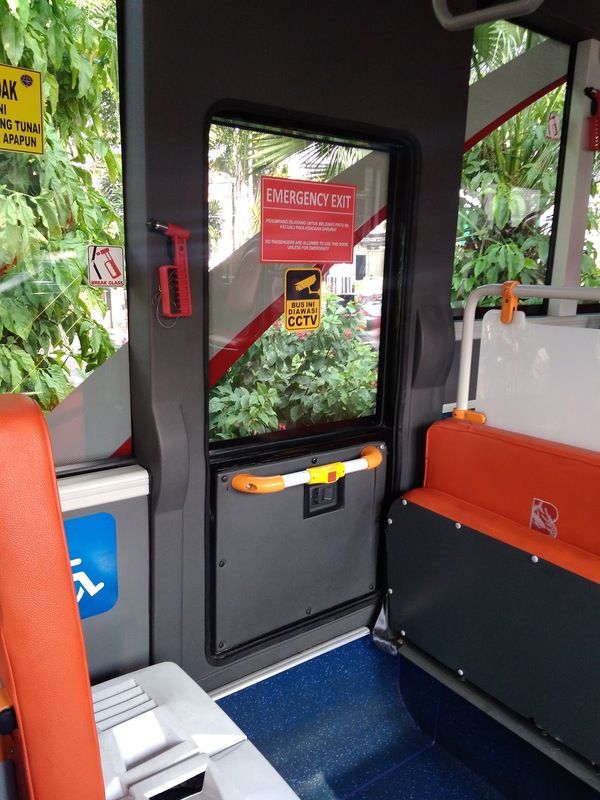 And also disabilities seats are quite close to the bus door and they have an automatic system to take a wheelchair along their owner in the bus. Fourth, make sure you're well-behaved. The bus itself has a CCTV system and is connected to the bus driver CCTV monitor and also Surabaya's command center in Siola government complex. Don't try to eat and drink during your bus journey because both of them are forbidden. Help our bus workers' to keep their working environment clean. Fifth, make sure you listen to every stop's announcement in case you're really unfamiliar come somewhere you didn't know. 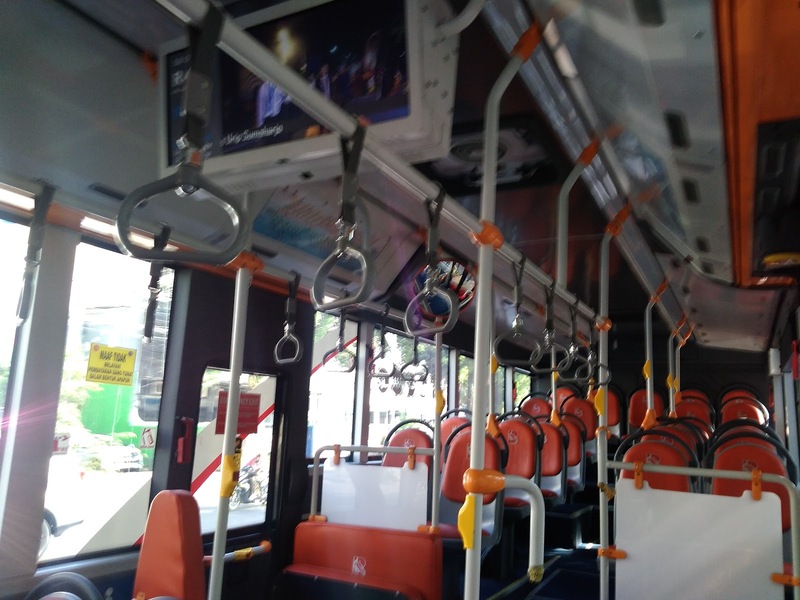 Their every stop's announcements are in English, Bahasa, and Javanese-speaking Suroboyo dialect. You can ask the bus conductor if you want to go somewhere close to your bus destination's stop. Surabaya's quite hot even in rainy season, it's best to take any preparations because the weather's quite unpredictable. Once you arrive at your destination's stop, make sure you have your luggage and say thank you to the bus staffs. 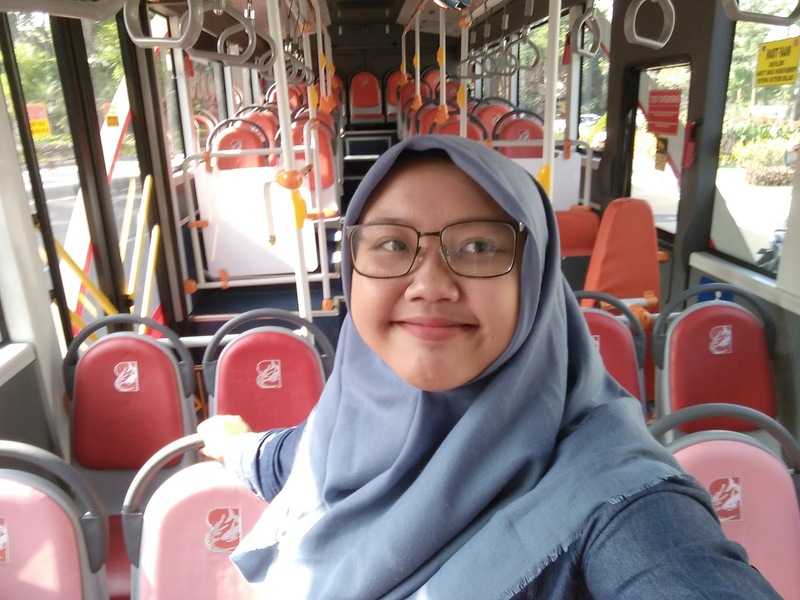 Overall, my experience in Suroboyo Bus was exciting. 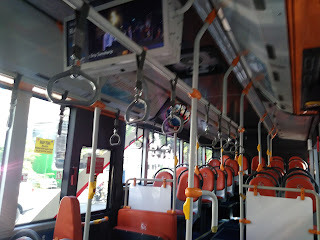 I enjoyed the journey because it's less traffic jam by bus than using my car or even a motorcycle. I can see things that I couldn't enjoy if I'm driving alone. The bus staffs and passengers are friendly enough to make me feel safe. Also, I'm less worried because my bottle trash managed by Surabaya's trash bank system, one of the best trash bank systems in Indonesia. 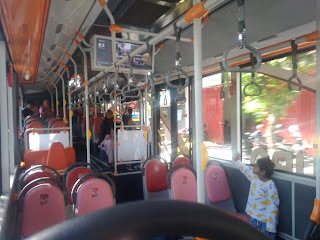 Even though the bus didn't serve a lot of routes to some district, the bus is a big help to get myself to my destination in the heart of the city. 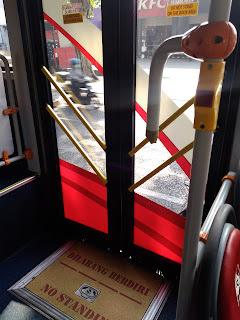 I wish Surabaya can maintain its public transportation because of Surabaya's weather and humidity are crazy hot enough to make you feel dizzy in day and sweat in the night. Surabaya's tram will be released in a few years, and some main roads like MERR-OERR in East Surabaya have connected Madura island-Surabaya-Sidoarjo making moving around the city easier. For further information, you can visit the Instagram official account of Suroboyo Bus, here. 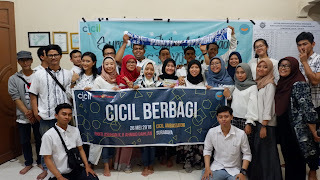 Enjoy your trip around Surabaya and I hope my article blog help you if you travel to Surabaya.